With the full summer crew now on the farm we were able to accomplish so much this week! We transplanted everything from sweet corn to tomatoes. We weeded, mulched, laid drip tape in the hoophouses, and at the end of the week we even harvested the one of our favorite new vegetables: Gailon x Broccoli. Treat this variety as baby broccoli— we think that it’s more tender and sweet than traditional broccoli, and the whole stem and the flowers are all edible and delicious. You’ll get a taste in your CSA share this week and hopefully far more in the weeks ahead. In these final two weeks before the spring CSA ends and the summer CSA begins we have forty-three more CSA memberships to fill! If you have friends or family who have been curious about joining the CSA in the past, now is the time to remind them! And please let them know that payment plans and financial aid are available. Visit the sign-up link here or at http://tinyurl.com/summercsa2015. Also, if you’re curious about the local grains “add-on” share, you can learn more about it in this week’s grain CSA newsletter. 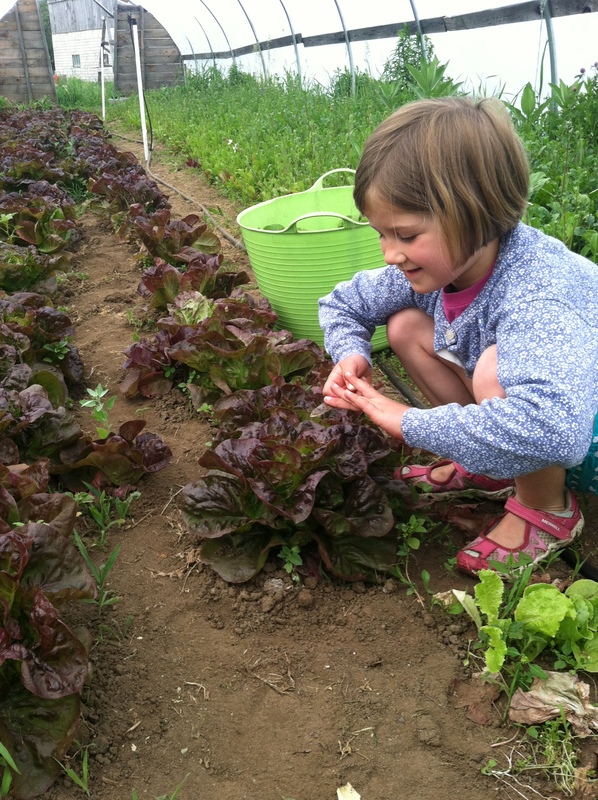 A link to the Grange Corner Farm grain CSA newsletter can be found here or at http://tinyurl.com/grangecornerfarm2. If you want to add it (or any other add-on share) to your summer CSA, just send me an email. Have a great week, and enjoy your greens! Grange Corner Farm Spring Grain #2 CSA newsletter and picture. CJ harvesting lettuce heads in hoophouse #3 on Saturday morning.